US National Security Adviser John Bolton has warned Venezuela that any threats against American diplomats or opposition leader Juan Guaidó will be met with “a significant response”. Mr Bolton tweeted on Sunday that any such “intimidation” would be “a grave assault on the rule of law”. They accuse President Nicolás Maduro of rigging last year’s election. President Maduro was sworn in for a second term earlier this month after an election marred by an opposition boycott and allegations of vote-rigging, triggering large protests. The political crisis in Venezuela now appears to be reaching boiling point amid growing efforts by the opposition to unseat Mr Maduro. Earlier on Sunday, Venezuela’s top military representative to the US, Col José Luis Silva, defected from Mr Maduro’s government, saying he recognised Mr Guaidó as president instead. Later, Mr Bolton took to Twitter to reiterate Washington’s position, warning others against any form of “violence and intimidation”. “Venezuela is not tied to Europe. This is complete insolence,” he told CNN Turk on Sunday. Mr Maduro added that he was ready to “engage in comprehensive dialogue” with those who opposed his presidency, and that he had sent Donald Trump “many messages”, but that he thought the US president “despises us”. He later appeared at a military exercise in Venezuela’s central state of Carabobo, where he called for “union, discipline and cohesion” to overcome what he described as an “attempted coup d’etat” by Mr Guaidó. 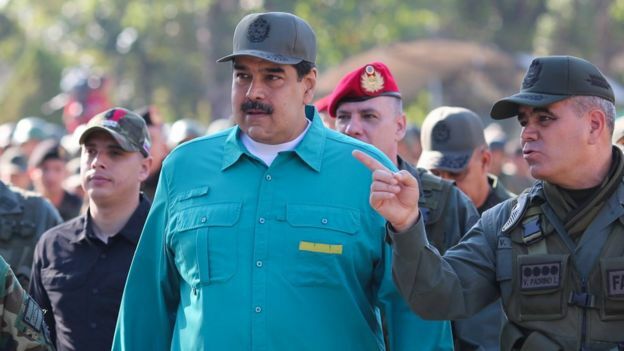 Mr Maduro broke off relations with the US last Thursday over the country’s support for Mr Guaidó, and ordered US envoys to depart Venezuela within 72 hours. However on Saturday evening, as the deadline was due to expire, Venezuela’s foreign ministry said it would withdraw the expulsion order, and instead allow 30 days for the two sides to set up “interest offices” in each others’ countries. Washington has previously said it does not recognise Mr Maduro’s authority to order its diplomats out. 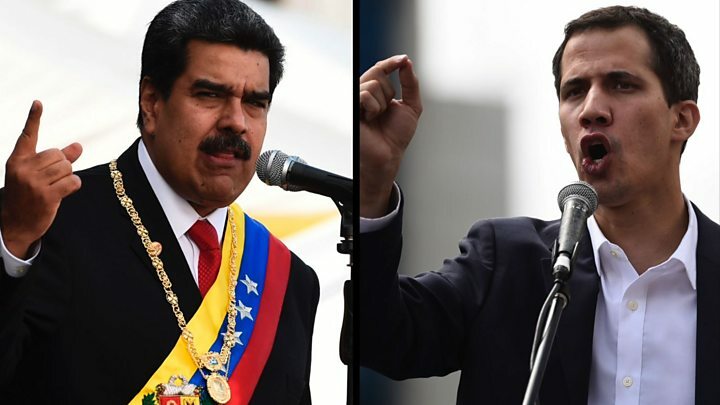 Meanwhile, Mr Guaidó told the Washington Post that he was in talks with “sympathetic military” officials in Venezuela with the aim of building support for his presidency. In Europe, Greece’s left-wing ruling party has backed Mr Maduro. Venezuela is in economic crisis – hyperinflation and shortages of basic essentials has hit its population hard and caused millions to flee.